I'd like cheese on my entire family! : Stabby! You guys! I've found THE perfect craft for me! If you've been paying attention thus far, you might have noted that my two go-to emotional responses to negative things are stabbing or setting on fire. 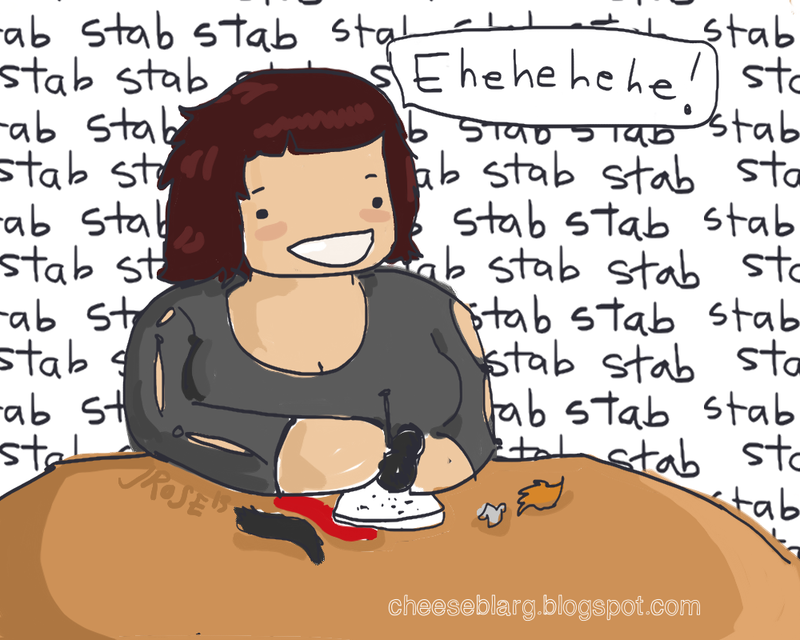 Some people are face-punchers, some people are poop-flingers, I am a stabber, and/or fire-starter. Not that I have actually ever stabbed or set anything on fire (that wasn't supposed to be on fire)... but when I am JODEE SMASH angry, the first thing that comes to my mind is stabbing and/or igniting things into a fiery blaze. So yesterday, seeing as I am on my yearly birthday trip to a city that is actually near things (things being places that everyone else in the non-rural country has access to regularly), I went to Michael's craft explosion store, and I bought a Needle Felting Kit. Some of you know what needle felting is (because you are awesome, and presumably a crafter), but for those who don't know, it is a craft wherein you take gobs of wool and then stab them repeatedly with a really sharp barbed needle until said wool turns into a thick felt lump of whatever it is you are trying to make. I was making a penguin, because it is going towards the Ornament-o-Rama project, and because penguins are pretty freaking awesome and cute. I should probably get some sort of protection when felting to avoid looking like my fingers are heroin addicts, but I am totally enamored with this new kind of art! Now I just need to find a craft where I set things of fire and yell at them! 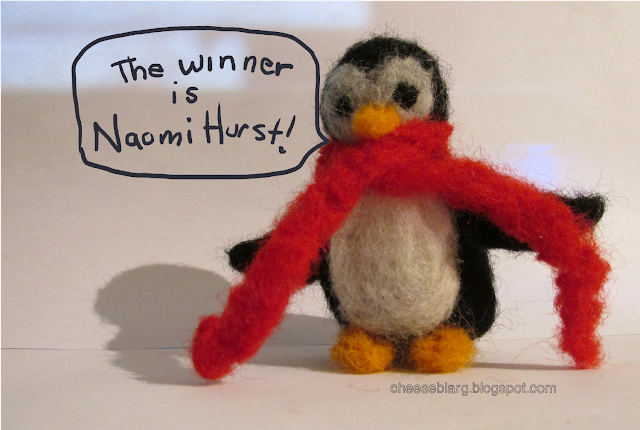 So Naomi, send me an email with your address and I will send a package out to you in the next couple weeks! Thanks, I'm just waiting until my stabbing arm is well rested to start on my next stabby friend. I've seen many people try that, over on Pintester, and it didn't work for them, so it might just invite some yelling, whilst trying to set things of fire! But then, what would I do with the cut bottles... OOH, I could use them for stabbing! Oh my goodness! I never win anything, so this is exciting :D I love Sir Wooly Waddlesworth. I tried my hand at felting once and it wasn't exactly what I would call a success...maybe I should try again. Ok, off to email. Eeeeee!! Jodee, he is so cute I literally said, "Eeeeee!" when I scrolled down and spotted him, and I like to play like I'm a lady of such deportment that I keep the squeeing to a minimum.